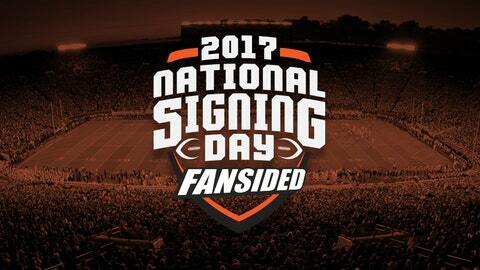 2017 National Signing Day has come and gone and 24 new Miami Hurricanes have inked their John Hancock on the doted line. How did Mark Richt’s first full class at Miami grade out? N’kosi Perry and Cade Weldon will be part of the quarterback competition in 2017. Miami has not seen two starting capable quarterbacks signed during the same cycle since 2008 when Miami signed Jacory Harris and Robert Marve. The quarterback haul for head coach Mark Richt was a good one and adds depth to the most important position on the field. Perry is the heralded Vanguard high school record breaking quarterback that is rated as ESPN’s 3rd ranked dual threat QB in the country. Coach Mark Richt praised Perry’s play-making ability, arm talent and also said, “He can run like a deer.” Perry does not benefit from the luxury of being an early enrollee, but he will get plenty of chances to show everyone why he was the overall number one recruit on Miami’s board come summer. Weldon is the son of former Florida State and NFL quarterback Casey Weldon. The elder Weldon’s Quarterback coach at FSU was Richt. He has the huge advantage of being on campus already and is assimilating to the college life. Weldon has excellent refinement in his game and also posses the capability to extend plays with his feet running for close to 400 yards in high school this year. Robert Burns shows brilliant flashes on film. Unfortunately Burns film is limited due to fact he hasn’t played a full season since sophomore year. Burns was recently photographed on Miami’s campus in a walking boot and is still recovering from an injury. This position group will have glaring depth concerns moving forward especially if Mark Walton opts for the NFL after the 2017 season. Ultimately a late miss on running back Anthony McFarland from Maryland will hurt the class grade although Burns shows potential. Jeff Thomas, Mike Harley, Evidence Njoku and Deejay Dallas bring in plenty of play making ability with a wide arrange of skill sets. Thomas and Harley in particular are part of the new influx of speed that coach Mark Richt covets. Njoku is a 6’6 red zone threat who has the wing span of a Boeing 777 and Dallas is a dynamic weapon with the ball in his hands and operates effortlessly in space. Thomas runs a 4.38 40 and is the recent Under Armour All American game MVP. He will add instant speed to the offense. Thomas has to be considered a deep threat and simultaneously shows the ability to take the simple screen to the house. 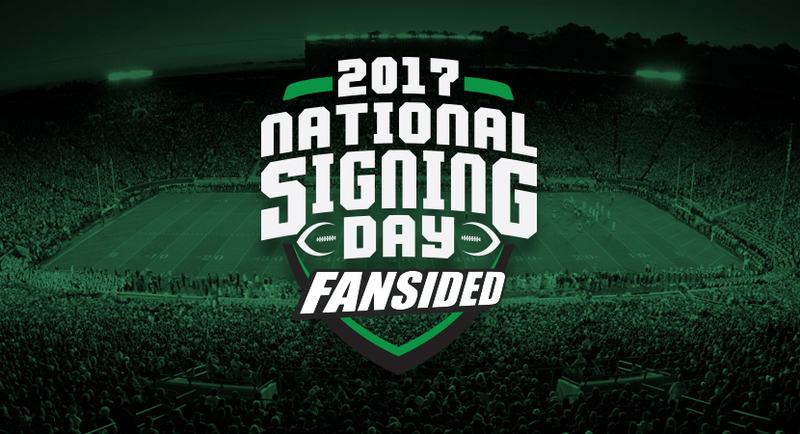 This highly publicized commit pledged his allegiance to the U on ESPNU and the staff’s reaction was euphoric. Another wide receiver, another celebration. Harley runs a 4.39 according to Mike Harley Sr and is also part of the “Speed Richt” movement. He compiled three touchdowns in the Florida 7A Championship game and has that I can get open in a phone booth trait. Harley can easily be considered a strong candidate in the return game this fall and has shown that same ability in high school at St. Thomas Aquinas. Evidence Njoku is the younger brother of first round talent David Njoku. Just don’t call him little brother. At 6’6 Evidence is a mismatch nightmare for smaller dbs and can instantly be called upon in the red zone for fade routes. Njoku does display straight line speed and has the capability to go over the top. He will need to work on his route tree a bit because he came from a very limited high school offense. We should have all learned not to take for granted anyone who has Njoku DNA. DeeJay Dallas has been recently assigned by coach Mark Richt to the offensive side of the ball. Dallas played a lot of quarterback in high school and even from that position you see his ability to create big plays with his feet. He has a great feel for the game and is shifty in space. The fan proclaimed “ambassador” for the Swag 17 class, Dallas will be called upon in spring to add depth to the wide receiver position after the losses of Stacy Coley and Malcolm Lewis. Navaughn Donaldson, Kai-Leon Herbert, Zach Dykstra, Zalon’tae Hillery and Corey Garynor provide much needed depth on the offensive line. Coach Stacy Searels should be commended for a great job this year on the trail. This quite possibly might be the most athletic offensive line recruit group at the U in a very long time. Navaughn Donaldson is a 6’6 345 lbs versatile behemoth who can essentially play any position along the offensive line. Donaldson has the ability to play left tackle down the road and is very athletic for his frame. He has great mass and gives a great pop at the point of attack. He was a highly sought after prospect who ultimately picked Miami. Kai-Leon Herbert is 6’5 282 lbs athletic lineman from American Heritage high school in Plantation, FL. Herbert was a late addition to the class and flipped his allegiance from Michigan. Herbert is another prospect who has great mass and length and can project as a left tackle down the road. Zach Dykstra is a 6’5 290 lbs offensive lineman from deep in the heart of lineman country, Iowa. Dykstra displays good base, player strength and displays good initial pop on defenders. He is a solid prospect who can eventually develop into a solid starter. Zalon’tae Hillery is a 6’5 275 lbs Georgia product from Glynn Academy in Brunswick, Georgia. He attended high school with Deejay Dallas. He has great motor and shows the ability to block on the second level. Despite having some rawness in his game, he has promising upside and can develop into a solid starter down the road. Corey Gaynor is a 6’4 280 lbs chef at the International House of Pancakes. With over 100 pancake blocks during his Sr. year, Gaynor shows toughness, fight and quite possibly could be the most underrated prospect of this class. Once Gaynor unites his demeanor with technique refinement at the college level, Gaynor could be the tenacious tone setter for years to come. Thirteen of Miami’s 24 signees are on the offensive side of the ball if we include Dallas. The defense signed ten and Punter Zach Feagles was also signed. The offense needed a greater infusion of talent in this class with the front seven returning intact two deep defensively. Richt and his offensive staff did a great job adding depth on the offensive line, playmakers on the perimeter that will be able to contribute in the return game and at Quarterback. Perry and Thomas can develop into special players and Donaldson and Herbert have the potential to be great bookend tackles.